A subject of major importance in fundamental physics is the investigation of the origin of Electroweak Symmetry Breaking. The mechanism of mass generation through the spontaneous breaking of a gauge symmetry is called the Brout-Englert-Higgs mechanism and is associated with the appearance of a physical scalar boson. The discovery announced at CERN on 4th July 2012 by the ATLAS and CMS Collaborations of a boson at a mass close to 125 GeV/c2, compatible with this scalar boson of the Standard Model, the so-called Higgs boson, mainly in yy, ZZ and WW decay modes, with compatible evidence also found at Fermilab in the bb mode, changed the landscape. This important discovery was acknowledged as decisive for the attribution of the 2013 Nobel Prize in Physics awarded jointly to François Englert and Peter Higgs. 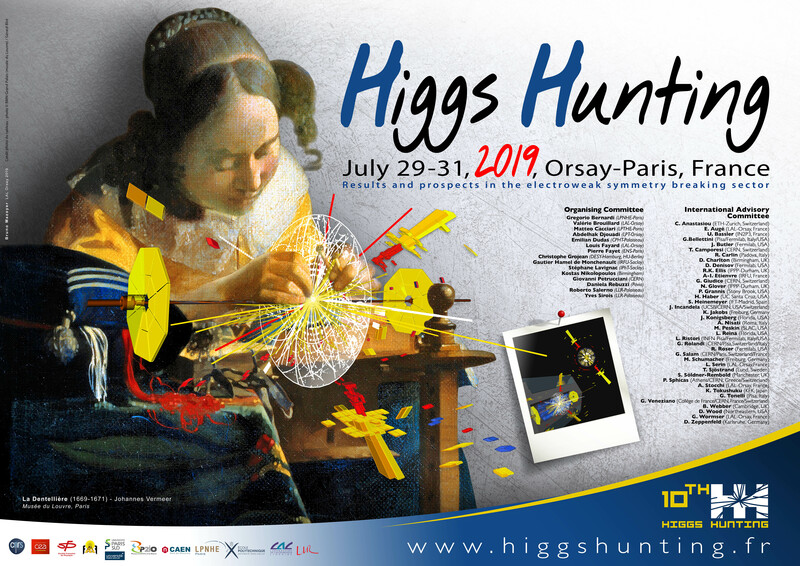 This 10th workshop of the « Higgs Hunting » series organized in Orsay and Paris on July 29-31, 2019 will discuss the developments of LHC run 2 analyses, detailed studies of the new boson and possible deviations from Standard Model properties. Searches for additional bosons, future prospects and recent theoretical developments will also be covered.